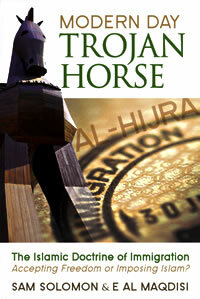 Modern Day Trojan Horse: The Islamic Doctrine of Immigration. The authors show from the Qur'an and Muslim sources, both ancient and modern, that the Islamic Doctrine of Immigration is an Islamic-approved method of changing a host society into an Islamic state. There are different types of jihad to advance the objective of establishing a society governed by Shari'a law. In this book, they show how the Islamic Doctrine of Immigration is a very effective form of stealth jihad. This doctrine was demonstrated in the life of Muhammad when he emigrated (Hijrah) from Mecca to Medina. In Europe especially, Muslims are advancing the cause of Islam by the Doctrine of Immigration without the use of jihad’s sword.